Excessive salt is everywhere! However, the majority of our salt indulgences do not come from the salt shaker, they come from processed, packaged, and restaurant foods that many Americans are addicted to. The average healthy individual is encouraged to eat no more than 2300 mg of salt daily; and if you’ve got high blood pressure, vascular disorders or heart disease, you should not get more than 1500 mg of salt per day. Table salt is made up of sodium and chloride. ½ teaspoon of salt has 1150 mg of salt. That little ½ of a teaspoon is very close to your daily intake allowance. Now factoring in the microwaved frozen meals, chips, crackers, canned soups, gravies, instant flavored rice mixes, and the list goes on and on, you’re salt intake is very likely skyrocketing above the standard daily allowance. What happens when we ingest excessive salt? Inflammation takes effect in our entire bodies and water is pushed and retained into the arteries, which causes high blood pressure and makes the heart work extra hard. 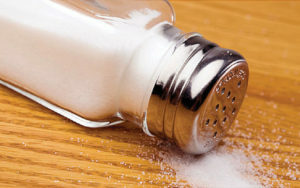 Too much salt increases your risks of strokes and heart failure, along with other disorders and diseases. Potassium can help to flush some excess salt out of your body. That is why most salt alternatives have a higher ratio of potassium in the mix. Many foods that contain potassium are bananas, plums, coconuts, avocado, potato and many more. But eating potassium to flush out salt is not a good idea, as it will take an excessive amount and potassium in excess causes other bodily harm like arrhythmias and muscle weakness. Keeping your sodium low is one of the major keys to keeping your blood pressure and heart healthy. Eating whole foods is imperative to keeping your sodium levels in check and also to make you healthier, by lowering cholesterol and upping the amount of antioxidants and nutrients you get from your meals. Shopping the periphery of the grocery store is a great way to avoid all of the processed foods in the center isles. There are exceptions of course, like frozen no salt added vegetables and fruit and dried spices to take the place of your saltshaker. For the most part, you should focus your shopping efforts on fresh produce, lean protein like poultry, seafood and eggs and some dairy. The Mediterranean or the Dash diet are exceptional examples of what foods you should be eating, which provide essential nutrients for the brain’s condition. All three of these diets emphasize eating plenty of vegetables, fruit, healthy fats, whole grains and lean protein (especially cold-water fish) while avoiding excess salt, sugar, simple carbs and saturated fats. Eating this way is thought to prevent cognitive decline by proving the heart, brain and entire body with antioxidants, and the good fats that it needs to function properly. Excessive sugar, simple carbohydrates, processed foods, and chemicals are known to cause inflammation and degeneration. When you shop, check the labels on your food and if you are buying processed, convenient foods, invest in healthier low-sodium versions. If you’re eating at a restaurant, ask for sauces of condiments on the side and use sparingly. Also, order steamed vegetables, lean meat and in general make wise choices.